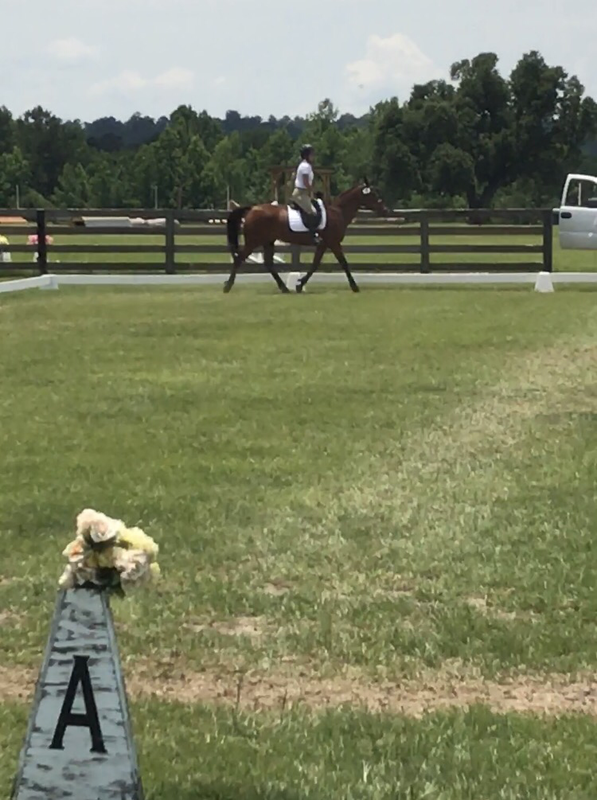 We got to the venue entirely too early: 9 am for a 1:18 pm dressage time. Trainer had recommended getting there at 10:30 but I’m way too high strung and decided to leave earlier. Yeah, not doing that again. My crazy Arabian endurance horse spent her 4 hours napping and shoving her face full of hay. 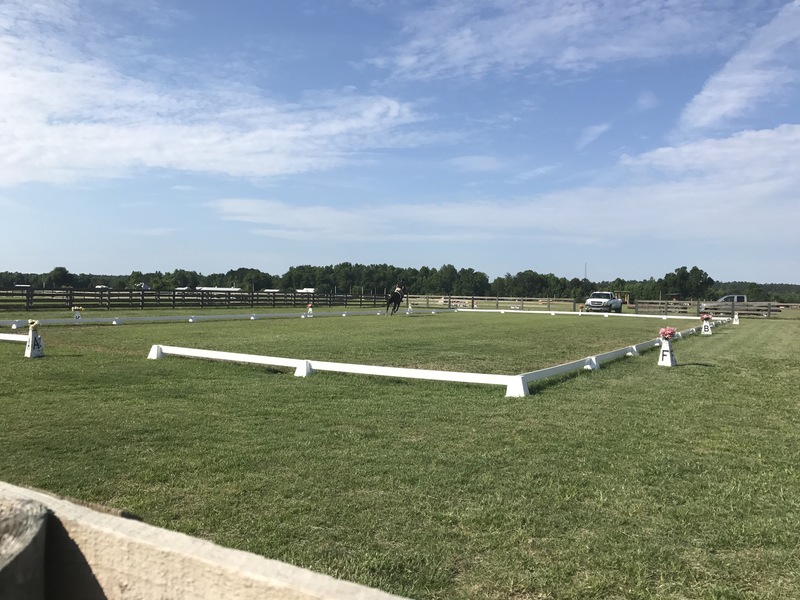 One of my biggest concerns was all the logistics, so as soon as we arrived I immediately signed in then headed to the dressage arena to get a look around. I had 4 hours to kill and it was heating up fast with no shade in sight. 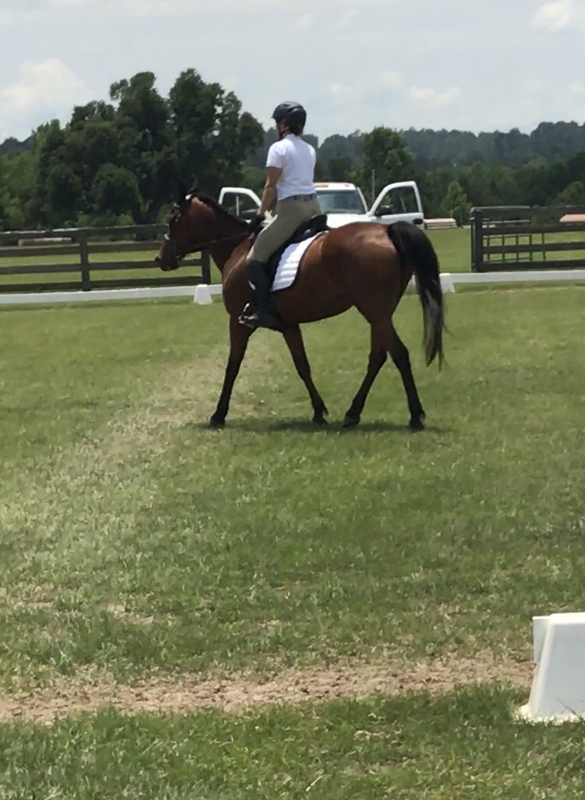 Dressage was in a spare grass paddock with the warm up ring in the neighboring one. The judge was sitting at C in a white pick up truck using the horn as the start signal. 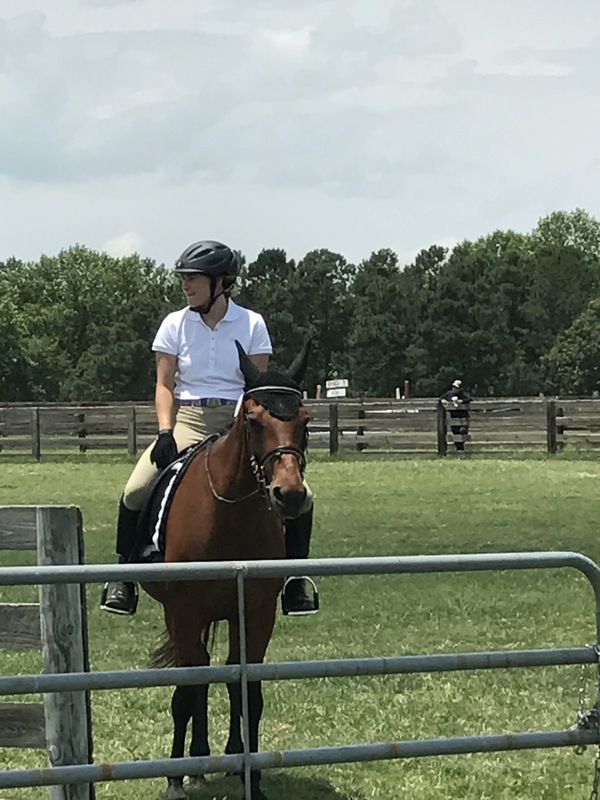 I watched a few riders go paying attention to when they entered the ring, how they went around and when they exited after their test. After that I wandered around the rest of the grounds. 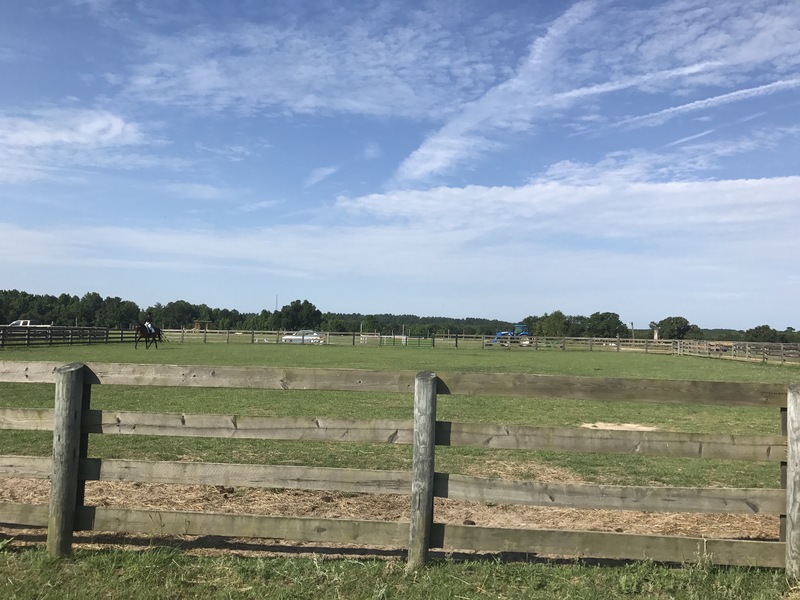 The dressage court. 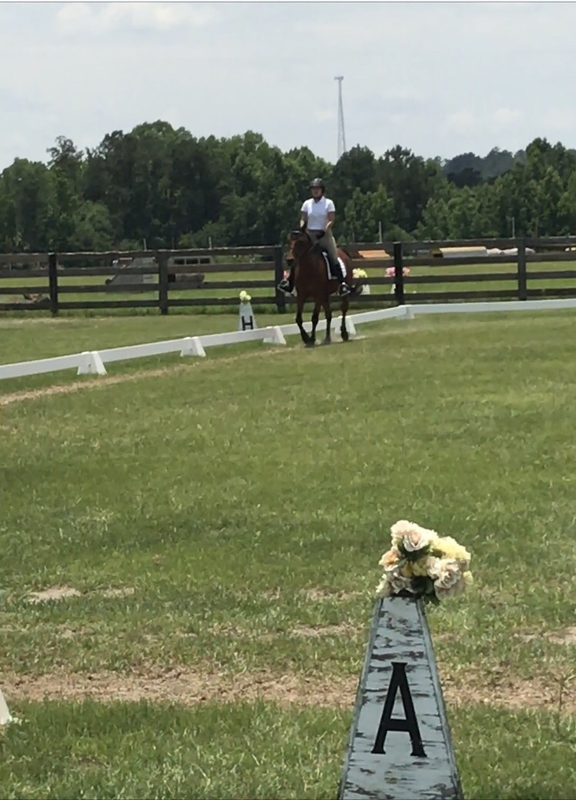 I was a tiny bit nervous going on grass since we have never done that before, but it was actually nicer than a regular sand arena. Killing 4 hours on a very hot (upper 80s with high humidity), sunny day with a toddler and no friends around isn’t really that enjoyable. By the time the clock said 12pm I was more than ready to get on and ride. 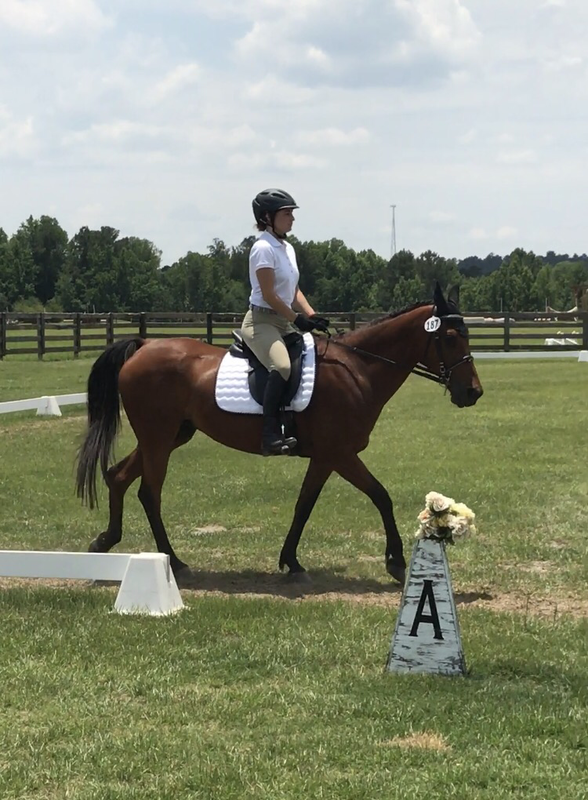 I tacked her up and she looked really gorgeous in the dressage gear. 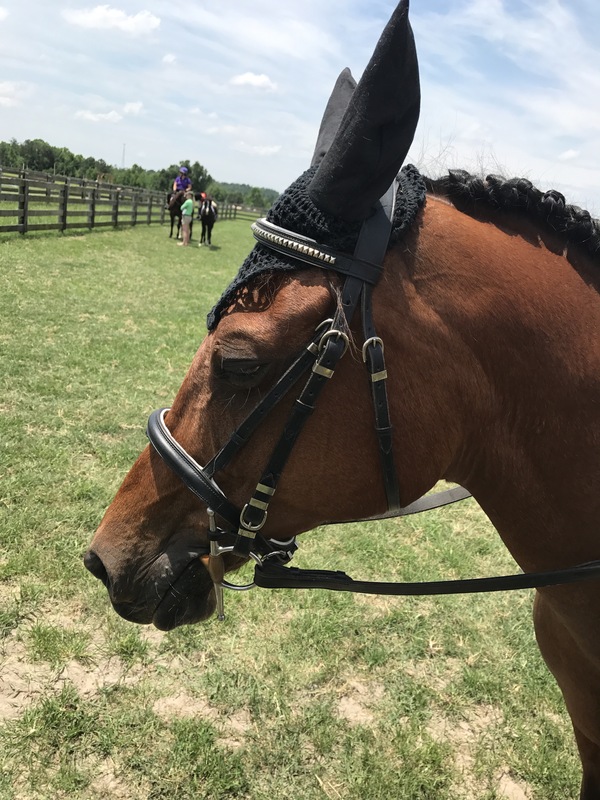 Her mane had been braided the night before and miraculously (well with the help of half a bottle of Quick Braid) stayed in. I just stood back and stared at her for a long while. Gemmie has a special place in my heart and soul. I can’t believe how very much proper we look! 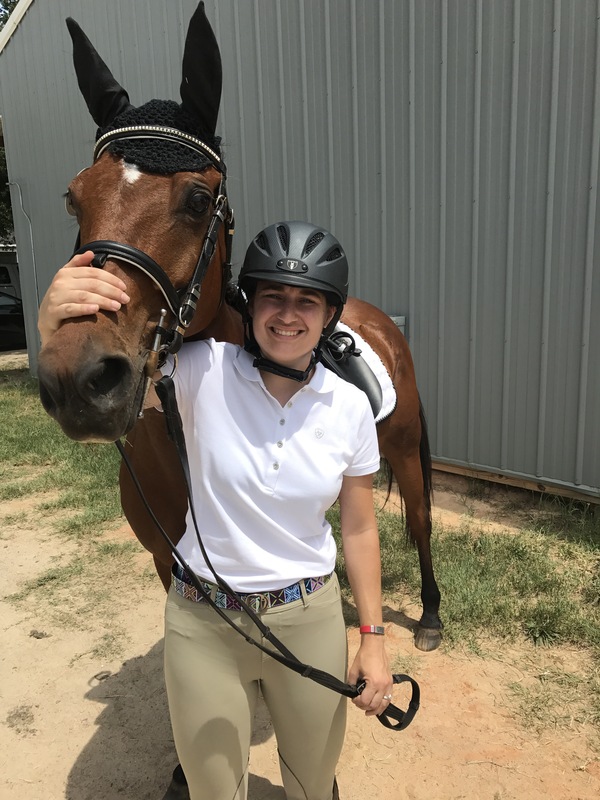 I opted to go very conservative in my attire with the exception of a beautiful belt I found at the tack store last minute. Just enough color to be pretty but not annoying. 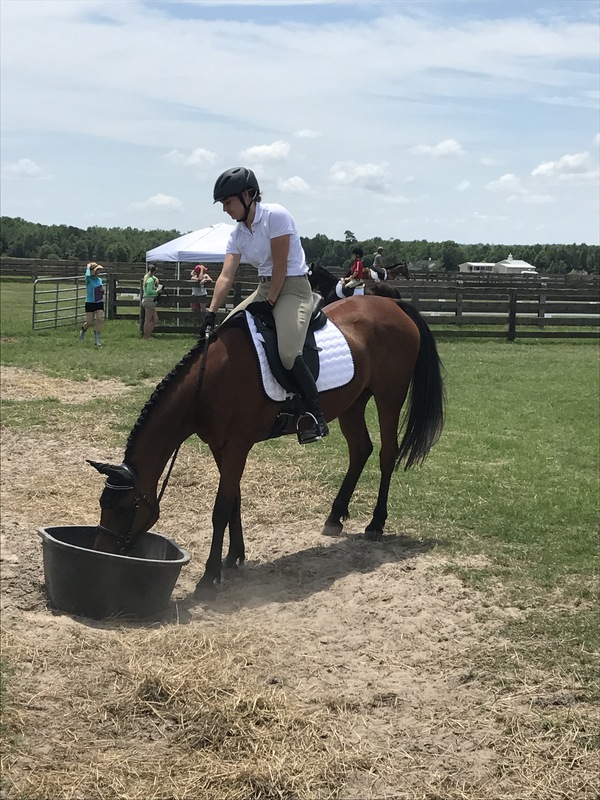 I had brought my white breeches too but wimped out of wearing them when I realized the night before that all my underwear showed through. 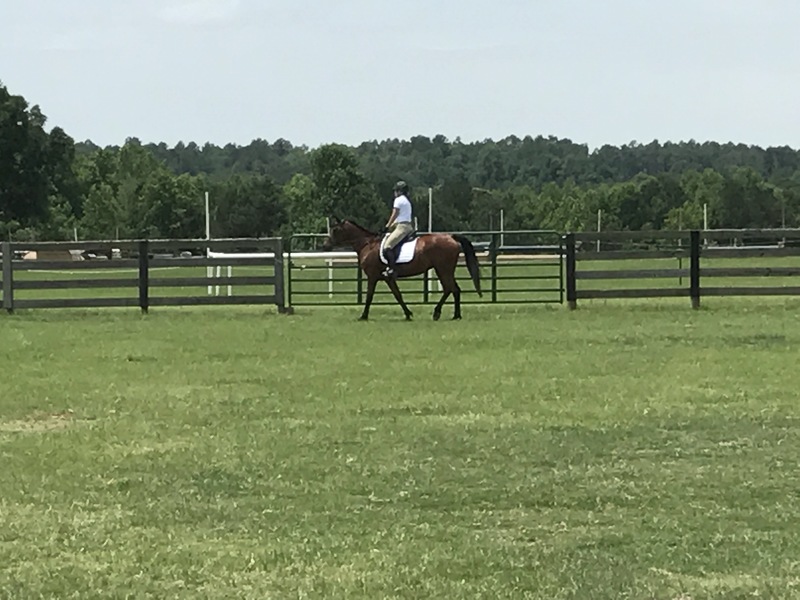 I was worried she would be a bit high strung walking down to the arena: the path led from the trailer parking, past the stalls, by the jump arena and ended at the two warm up arenas and dressage court. It was a very busy walk. I shouldn’t have worried. She was a saint. By the time I began my warm up at around 12:30 pm my shirt was sticking to me and sweat was pouring down my face. I worked on halting first since that has been a big issue. Gem has really come around nicely and will now halt with just the slightest request. I’m loving it!!! I offered her up a drink knowing she had to be as thirsty as I was. She took a sip and promptly spooked at who knows what in her reflection. Maybe she noticed how proper she looked versus her typical endurance wild self and got scared. 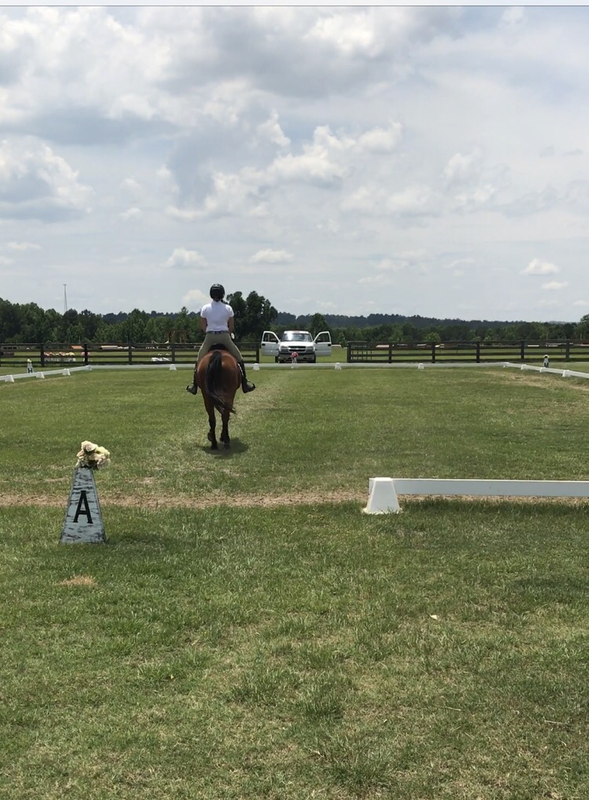 I was glad that the warm up area shared the same views as the dressage court would. Gem was able to look at the cross country course where people were schooling. After that I worked on bend a little. I’m not that great at it and really need to focus on that. She is more like a surf board than a living being with joints. Anyway…I kinda ran out of things to do. It was really hot and she was sweating after working on all that and I wanted her to be fresh but relaxed in the test. With still 20 minutes to go, I hung out at the fence talking to Dusty and my parents who made the drive to watch me ride. I really appreciated them coming specially since all things horse isn’t really their thing. Waiting at the gate to enter as I run through the test in my head one last time and try not to vomit. I’ve never been so nauseous on a horse before. Looking back I know it was partly nerves but it was a great deal more the fact that I had eaten exactly nothing all day and drank not nearly enough for the time spent in the heat and sun. My throbbing head by 3 pm let me know I wasn’t doing so good at self care. I also love Gem’s face in this picture. At 1:26 they finally told me it was my turn up next. I’m not sure how these things typically go, but figured 8 minutes late wasn’t so bad. It was around 1:35 when I started. I spent a bunch of time making a fancy video with all the scores and comments on it. Then I promptly didn’t save it correctly and now I’m too frustrated to do it again. Instead I’ll just run through it here and put the video at the end. 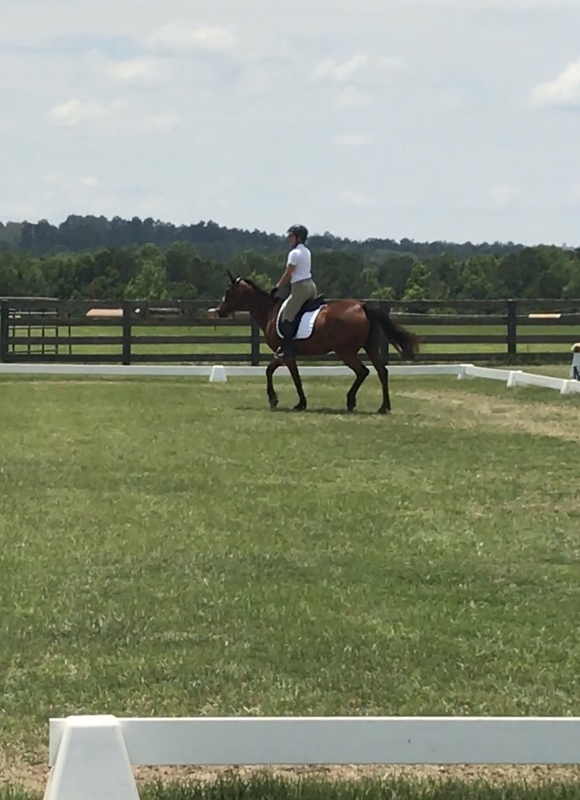 When I entered the dressage court, I made Gem walk around the outside and past the judge truck to say hello. I kept her sedate and calm preferring to have to wake her up than wrestle her back down. The judge was super nice and asked if I was ready to which I replied that I never would be so go ahead whenever she wanted. She laughed and honked the horn when we were at E going away from her. 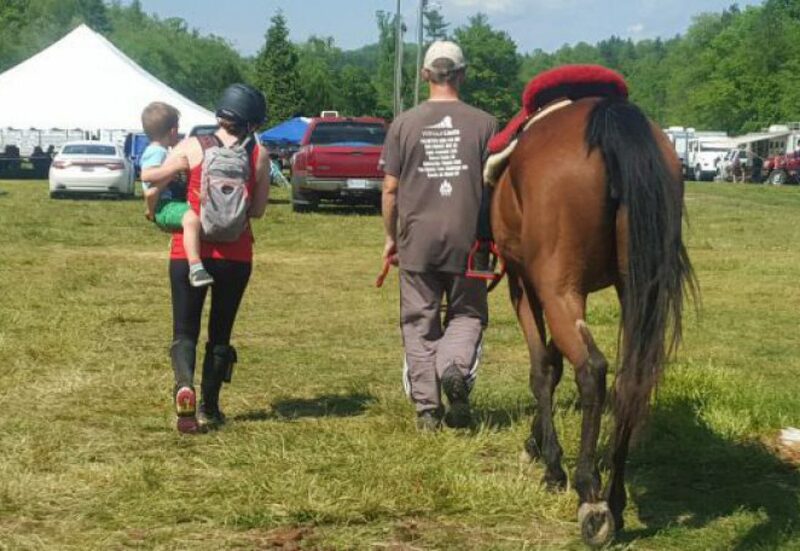 At that point I picked up the trot and rode to A where we turned and entered. Gem was moving forward a little behind me, but was relaxed and honestly with how tense I was she was doing a great job at ignoring my negative energy. I asked her to walk about 2-3 strides out of X then she halted. I saluted too soon and she moved during it which just made my stomach tighten since this was the very start of the test. I ignored it the best I could and asked her to trot on to C where we made a left turn and wandered down to E. Gem tried to spook a bit at the flowers, but I put my legs on her and she got the memo that I meant business. 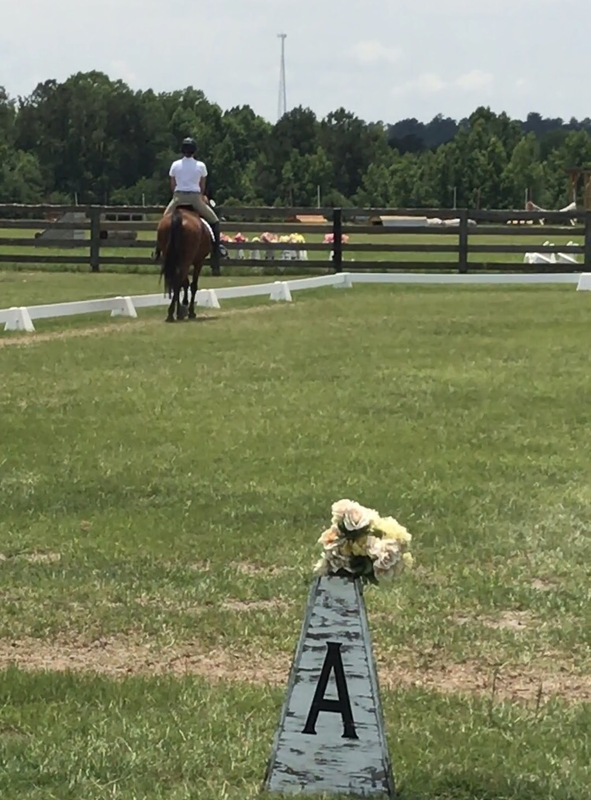 I took a big deep breath here to try to relax in preparation for the 20 meter circle at E. left is our stiffer side (or so I thought) and I needed her to relax as much as possible. Gem was being so insanely good too. She kept the same rhythm throughout without me having to do much nagging or bringing her back. It was just really pleasant to ride. I tried really hard to look around my circle although I have a habit of not looking far enough ahead. Gem felt much more rigid than she apparently looked to the judge. The circle I was trying hard at keeping large and round was not such a big hit though. 6.5: watch the shape and size of circle. My head is looking around the circle, but my body is most definitely telling her to travel straight. Much work to do here! 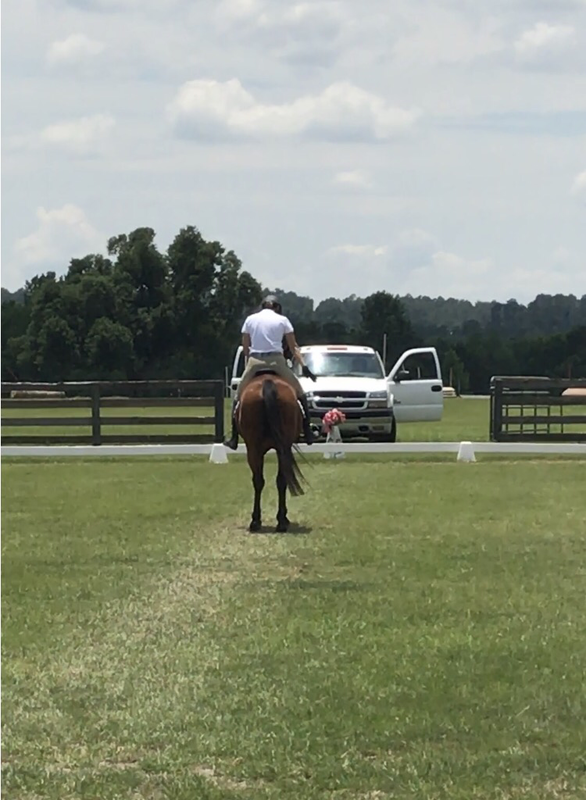 When we got back to the rail I made certain to straighten up when my body hit E. Trainer had made a big deal about me not ending my circle before then and I wanted to be as accurate as I could be. From there we traveled to the corner where I used it to help her transition to the medium walk between K and A. She listened really well and walked straight off. I was really proud of myself when she started to build as we got to A and I used a half halt to maintain the walk. Trainer is always getting on me for reacting before Gem speeds up instead of waiting until after we are trotting. You can see how tense I am here but my heels are down and my leg is under me so that’s a win in my book! F came up quickly and it was time for the free walk. 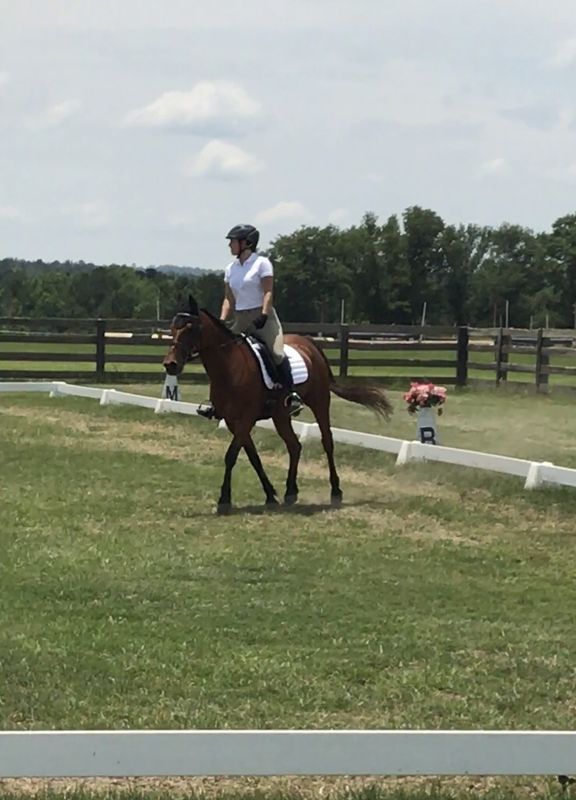 I had practiced it a little in warm up and Trainer’s advice rang in my ears: don’t let her break to trot, it is better to be boring and walk than flashy and break. Well, I didn’t go for glory here at all but I think Gem was tired of my tension and she broke to trot twice across the diagonal. It really hurt my psyche to have her do so halfway through the test but I put it out of my mind and moved on to the next one. This screenshot is during one of her trot breaks. I tried to open and lower my hands but she trotted each time. You can still how how tense I was. No wonder she trotted! Once we were back at E and on the rail I “picked up the contact” and went back to medium walk. Really there wasn’t much difference. The corner came up and I used it to make the transition to trot which she did immediately. Her transitions are really just becoming sharper and sharper without the shuffling steps leading up to and out of them. The right 20 meter circle has always come easier mostly because my right leg isn’t as useless as my left so I tend to have at least a hint of inside leg. We made it around without losing our rhythm which was my main goal. Back at B and it was a straight trot back to center line at A followed by our last halt and salute. All the above photos were taken as screen shots from the below video. I was really, really happy with Gem. I mean, she did exactly as I asked without any shenanigans or issues at all. I was way too tense and lacked any bend in my own body, so I can’t expect her to be Mrs Bendy herself. I found out later that we had scored 33.44 which put us in 5th of 9 riders. Scores ranged from 26-39 so it seemed like the judge was nailing some things hard and being rewarding with others. ​​​Having never done this before I’m not sure what to make of the actual score. 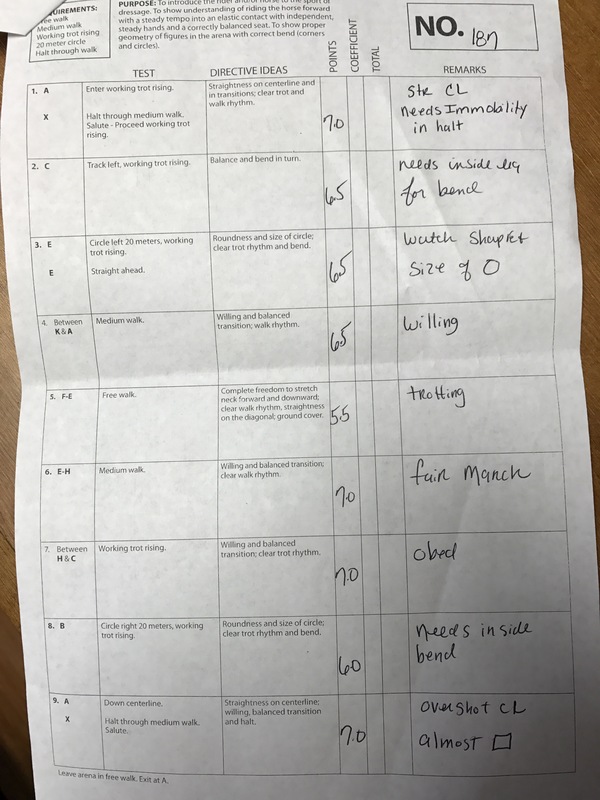 Trainer was really happy with it when I texted her my sheet later in the day. Seeing a 7.0 on all of Gem’s stuff and on my position made my entire day. The rest I can work on and improve but seeing that she didn’t ding Gem for poor movement or anything was a big confidence booster. Plus my position has always been something I am self conscious about so getting a 7 on that made me smile big time. 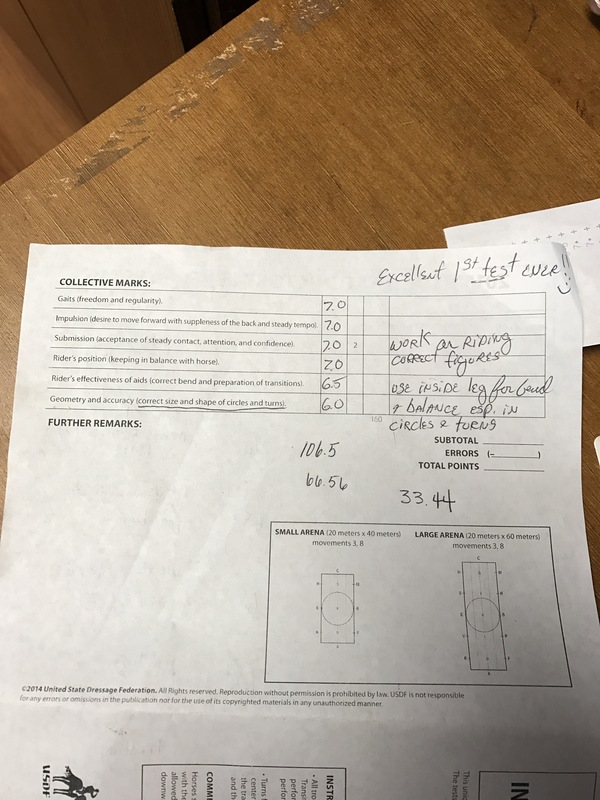 And then there is the little Gem on the back right corner of the test: Excellent first test ever!!!! 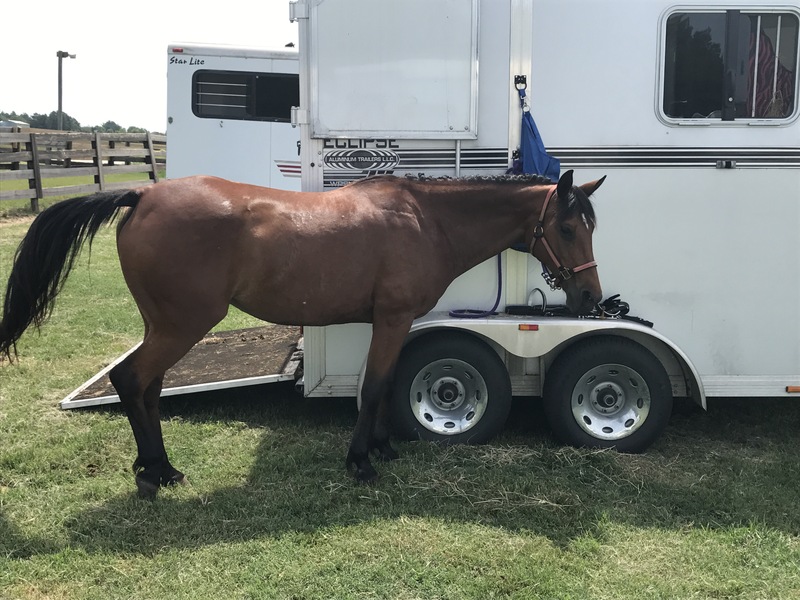 ​Once I was out of there I headed straight back to the trailer to change her tack out. It was already 1:45 pm and stadium was beginning. I didn’t even think to look at scores. It just wasn’t important to me. Gem’s feelings for dressage mimic my own 🙂 But great job! 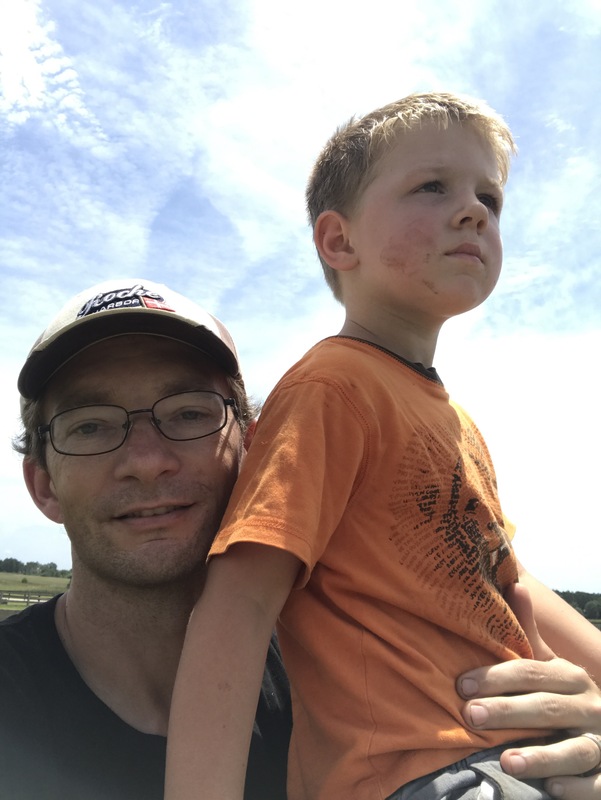 And surviving that long with your son…I think handling the kids are way worse than the horses! Yeah he did pretty darn good for a hot and bored 4 year old. yay i love all the pictures! and great call on getting there early to watch, and have time to just sit and chill with the horse, that always really helps me out and i’ll often take that opportunity to hand walk the horse around the grounds too. 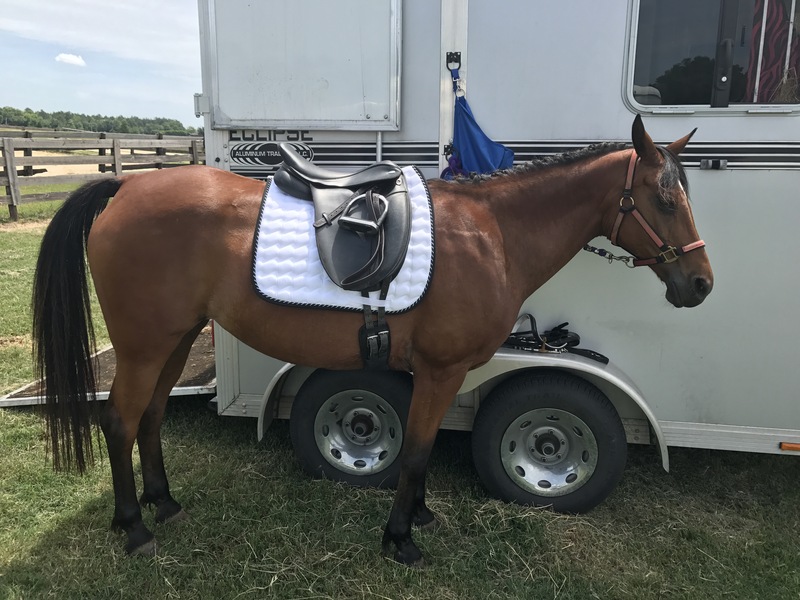 seems like the judge rewarded your consistency and your horse’s relaxation. for me, the actual numerical score itself matters a little bit less than how it places relative to the group – since many judges will use wildly different scales but most can agree on what order to put the riders in. but really, like you say, at an event like this it’s not really about the score at all as opposed to just getting out and doing it. Gem looks so good and happy, can’t wait to read about stadium! I keep saying this but her new relaxed zen frame of mind just blows me away. I think I’ll need to start stepping up my game though now that I don’t have to worry about her being so over dramatic about my requests. It is a whole new world for sure. Congrats on your first outing together at a HT! I would say its definitely a success. Congrats. It definitely gets easier to do (and drinking and eating helps). You’ll be way less anxious next time. I look forward to hearing about your jumping. Those are great scores – you should be proud! Thank you. I was really pleased. Yes! When I show up too early, which is you know, all the time, I get more anxious lol. Either of those options is the cure! You guys look so sharp! Thank you! She cleaned up nicely. Coming from endurance where anything goes, I was worried I’d feel odd all dressed up. In reality I really liked it!